Released on May 29, 2015, the movie San Andreas tells the story of massive earthquakes devastating California as a helicopter pilot and his (formerly estranged) wife try to find and rescue their daughter. Formerly known as The Rock, Dwayne Johnson, finally meets his match in the shape of those shifting rocks that underlie California. In the process, he makes any husband/father feel inadequate with his superior muscular physique and helicopter-and-plane piloting/skydiving/speed-boating/all-out-rescuing skills, all while being a nice guy who just needs a second chance! In its successful first weekend, probably more people watched the movie than the number of Californians who have earthquake insurance. Whether that translates into better earthquake risk awareness is another question. A lot of the science in the movie sacrifices credibility for spectacle and drama. The disaster is so apocalyptic that it may reinforce the notion that we're all going to die anyway, so what's the point in preparing for it? But there does seem to be some increased thought about preparation. There has been a minor uptick in people googling earthquake insurance and the CEA has noted a doubling of hits to its website. In fact, the likely reality of a future large earthquake in California is much more mundane. Only a small proportion of buildings are likely to collapse. Of course that is still too many and it could still cause significant hardship. While the movie presents the disaster as "over" by the end of the movie, the real disaster may just be beginning in real-life. The economic cost could be staggering, and may take years/decades to recover. Only around 10% of Californian homeowners are covered by insurance against earthquake damage. It's easier to sell a movie about earthquakes than it is to sell insurance for earthquakes, but there is opportunity for change. Now is the time to come up with something innovative. * Drop! Cover! Hold on! Paul Giamatti's seismologist character correctly asserts that this is the best thing to do when you feel shaking. Running outside exposes you to things falling off the building, and cowering in the doorway exposes you to a swinging door in the face. * Drawback. 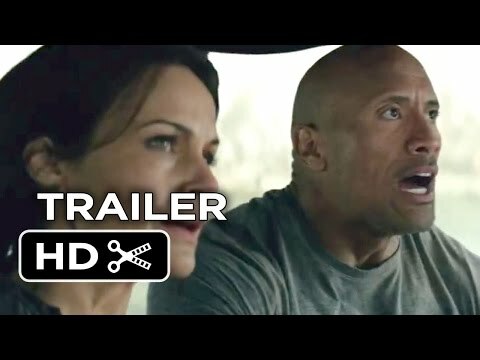 Dwayne Johnson's character notices that a tsunami is coming because the waters first recede. Prior to the 2004 tsunami in Indonesia and Thailand many people went towards the beach to see why the rocks and fish were suddenly all exposed. We must say that the potential for a notable tsunami from a strike-slip fault earthquake (like the one in the movie) is almost non-existent. * Ongoing aftershocks. Throughout the movie, the stars are rocked by a regular series of aftershocks. Aftershocks are an often overlooked component of how terrifying an earthquake can be. Their occurrence is so ubiquitous that the decay in number over time is described by a statistical relationship known as Omori's law. Survivors of an earthquake often comment on the personal stress and anxiety of experiencing numerous smaller shaking events throughout the days and nights after the main shock. * Earthquake swarm. The beginning of the movie describes an "earthquake swarm" in Nevada. This is a very real phenomenon that we described in a blog a few years ago. However, a seismologist would not be as surprised as those in the movie by the occurrence of earthquakes in Nevada. * Fire following. The movie correctly emphasizes that an earthquake will likely cause gas pipes to break and fires to break out. This has potential for a major conflagration, as was the case in the 1906 San Francisco earthquake. * The earth opening up along the San Andreas. The notion of chasms opening up in the earth due to an earthquake is a common myth. Earthquakes are caused by rocks being pushed together. The two sides of the San Andreas Fault would slide past each other and never pull apart. Otherwise there would be no friction to cause the earthquake. * Magnitude 9.6 earthquake. The magnitude potential for the San Andreas Fault is drastically overstated in the movie. After some quick calculations, such an earthquake would require around 12,000 years of build up since the last earthquake. In reality, there has only been about 1% of that. We also did some calculations as to whether an earthquake of that size would "be felt on the East Coast", and the answer is no. * The tsunami is only one wave. In the movie the tsunami hits the city, then the water remains. In reality the water would recede. It seems to be a major misstep to give people the impression that they are safe after the first wave. A tsunami made up of multiple inundation waves. Regardless of what the movie got right, and what it got wrong, anything that keeps us talking about the dangers posed to California by earthquakes is welcome. The insurance industry has been a part of that dialogue for decades and we welcome Hollywood's contribution. Tags: #earthquakes, #California, #San Andreas fault.